The New Adventures of Frankenstein is an eleven-part comic pulp novel series written by Donald F. Glut and illustrated by Rick "Spine" Mountfort. This is Tome #5, Frankenstein vs. 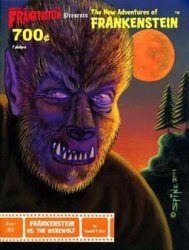 The Werewolf. Each issue of this 11-part comic pulp novel features 66 or more pages in B&W and fully illustrated. Color cover. The New Adventures of Frankenstein is Copyright 2001 by Donald F. Glut. Published in 2001 by Dennis Druktenis Publishing. All ads and contact information contained in this publication are no longer in effect. Any inquiries, letter and submissions should be sent to scarymonsters@mymoviemonsters.com. Collectors Note: Purchase the complete set of 11 issues and save by clicking here.